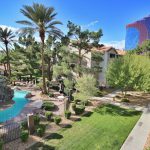 The world famous Las Vegas Strip Resorts and Casinos pinpoint this gorgeous 1-bed/1bath fully furnished condo. This first floor extended stay rental is located in The Flamingo Palms Villas community. This community is conveniently located right off the I-15 freeway. With close access to the I-15, maneuvering around the city is a breeze. The Palms Resort and Casino is just 100 yards away and the World Famous Rio Casino is across the street. Stay close to all the fun without the high intensity of being on the Strip! Extended stay hotels in Las Vegas is no match to this gorgeous condo. This stunning ultra-modern fully furnished executive condo has a newly revamped interior. This 1-bed/1-bath is beautifully decorated with modern and cozy furniture (as seen in the picture on the left). Along with tile flooring, hardwood in the bedrooms, and granite counter tops throughout; the bedroom has a king size bed and there is a designated area for laundry equipped with a full size washer and dryer. Both the living and the bedroom have Flat Screen TVs and all of our units come standard with your complete house hold necessities; Kitchenware, Housewares, fresh Towels and Linens. The monthly rate includes all the utilities even Cable TV and Internet with WIFI. All our units have everything you need ruling out any reason to stay at an extended stay hotel in Las Vegas.